A candidate for New York’s Attorney General has vowed to not only “abolish,” but “prosecute” the Immigration and Customs Enforcement (ICE) agency should she win the office. 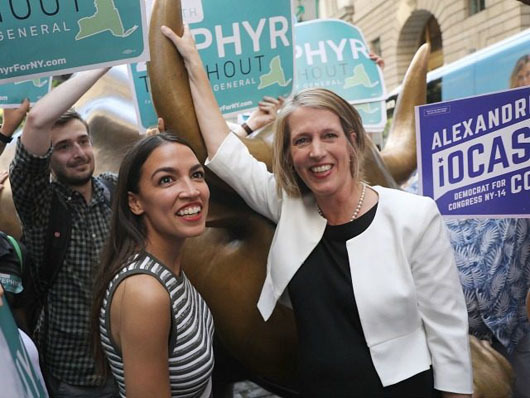 “ICE has to be abolished, and I say that as somebody who is running for one of the top law-enforcement jobs in the country,” said progressive candidate Zephyr Teachout, a law professor and an ally of Alexandria Ocasio-Cortez, the Democratic candidate for a House seat in New York who jump-started the Abolish ICE! Campaign, Breitbart News reported on Aug. 1. “ICE was born in xenophobia, in a time after 9/11 and has grown up to become a tool of fear and illegality. And as Attorney General, I will continue to speak out against ICE, I will prosecute ICE for their criminal acts,” Teachout said. According to a July 31 poll by Siena College, Teachout is third in the race with 13 percent support. New York City Public Advocate Letitia James leads with 25 percent of likely voters, compared to 16 percent for Rep. Sean Patrick Maloney. The poll shows Teachout has 27 percent favorability among Democrats, while 61 percent say they are undecided about her. Teachout is a law lecturer at Fordham Law School in New York, “where the huge population of illegal-immigrant service-workers has forced down wages for the ordinary Americans who make her takeout coffee and bus her restaurant tables,” the Breitbart report noted.